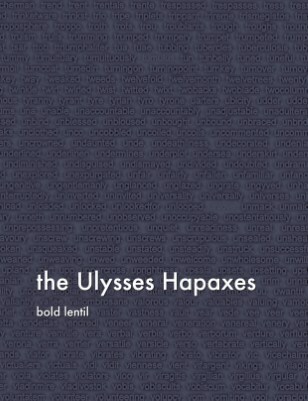 Finally all the hapax legomenon from James Joyce's Ulysses in one place! Based on an analysis of the Project Gutenberg edition of the book is the Ulysses Hapaxes. The text was first cleaned with the admittedly simplistic steps of punctuation removal and conversion to lower case characters. Next each white space separated word was frequency sorted and words that occurred only once were listed in alphabetical order. A space was added every 100 words to break the hapaxes into blocks for easier visual inspection. The first word for each letter is printed with bold blue text. No effort was made to further categorize these hapaxes, for example differentiating those words which are just rare from those words which are unique to Ulysses. Regardless the result is one which provides a unique view of the literary style and skill of Joyce at the lexical level. Specifically his vocabulary, neologisms and tone can be compactly appreciated in convenient form.